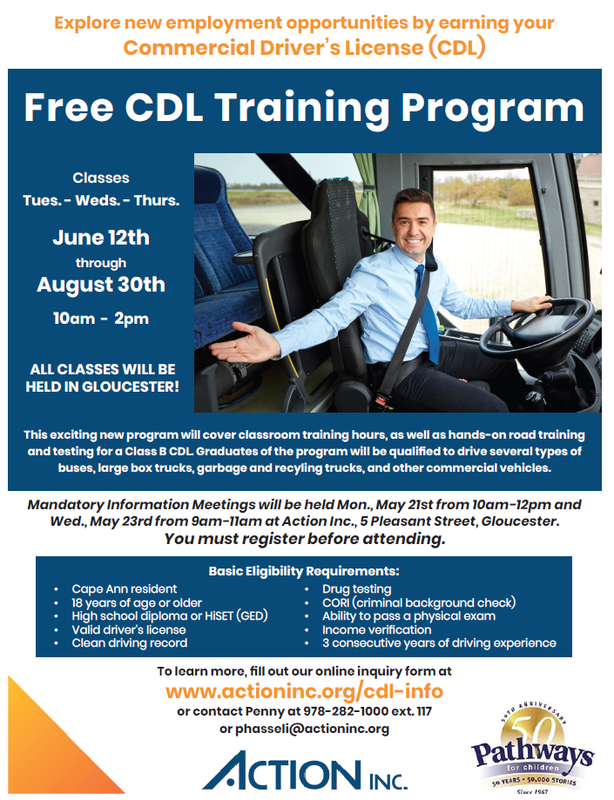 If you or someone you know is interested in a life-changing opportunity to earn a Commercial Driver’s License (CDL) there is a free training program that you should know about. This is a life-changing opportunity for Cape Ann residents to gain a Class B license with A, S, and P endorsements for free! The mandatory information sessions are next week so if you know anyone interested, please have them contact Penny Hasseli 978-282-1000 ext. 117 or phasseli@actioninc.org ASAP. It’s a 12 week program that covers 28 hours of classroom training for the general knowledge permit test, and 32 hours of hands-on driving time for the road test. Program dates are June 12th through August 30th. Classes are Tuesdays, Wednesdays, Thursdays from 10 AM-2 PM. Classroom instruction will be at Action, and driving instruction will be at O'Maley Middle School.